Last week my family and I took a week's vacation in Crested Butte to do some hiking and relaxing in the beautiful Colorado Rocky Mountains. 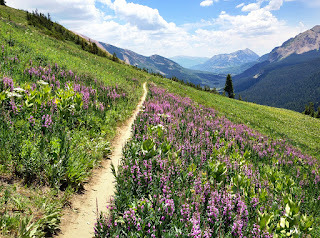 Although we missed the Crested Butte Wildflower Festival by one week, we still enjoyed the flowers on our hikes. As we explored the Crested Butte area and enjoyed numerous hikes, we got to spend time together as a family which I really enjoy doing. It's hard to believe that my girls are basically adults now (they are 15 and 20 years old). Bailey even got a second week of altitude camp in for her cross country training by running every day that we were there. My in-laws even joined us with our two nephews and we all had a very relaxing time together. We even rented some paddle boards and went to Lake Irwin one day. This wasn't something that would have been very easy for me to do, so I enjoyed watching everyone experience the paddle boards for the first time in a cold mountain lake. Crested Butte is a sleepy little mountain town with a well-known ski resort. We enjoyed hanging out in town, checking out the restaurants and shops, and also finding trails to explore all around the area, including on the ski mountain. Unfortunately, the Crested Butte ski resort was recently acquired by Vail Resorts. This means that it will be completely over-developed soon enough, everything will become too pricy and too crowded with traffic just like all the other resorts it owns. What a drag. Later in the week, we visited a friend in Lake City and hiked Spring Creek Pass, a high mountain pass with an average grade of 7.5% at 10,901 feet. My phone told me that I climbed 50 flights of stairs that day which was quite an achievement for my withered legs. When we returned to the car, we took a photo by the trailhead sign and Janene had her arm around me and said, 'Your legs are shaking, you need to sit down.' I just chuckled and said, 'Yeah, I know.' Even so, I loved it! I am so thankful to be able to feel that exhaustion from completing a difficult hike. Very interesting blog. I'll return when I have a little more time to look around.